Set out haystack toppings (we usually keep the taco meat in a crock pot or saucepan on the stove so it stays warm) and let everyone layer their own toppings on their individual plates in the order they prefer. Enjoy! Growing up, we served this more times than I can count when we had a big group of guests over. It’s great paired with a fruit salad and Green Rice Casserole. By the way, if you’re the kind of person who prefers exact measurements, I found that is similar to the one we make. Hope you’re feeling better. There was a time when I had constant sinus infections, so I was on meds for months. They tire you out! But, I hope you are feeling better soon! I can’t imagine constant sinus infections! You poor thing! Way to go on your freezer cooking! My issues were before-children, so it wasn’t as bad…I could lay on the couch all night and whine 🙂 But, it’s so hard when you’re a sick Mommy…praying you’re better soon! I hope you feel better! If I were doing this, I’d definitely make my own quick salsa or pico de gallo– I can never go back to the jarred/ canned obscenities. No fun – I had a sinus infection the week before last… yuck! The z-pack worked for me, thankfully, but it did take some time. Get some super soft tissues – I went through two full boxes throughout the course of mine and my nose was raw (using tissues I’d gotten free 🙂 ). Unfortunately, my eight month old is now suffering from his first double ear infection. I’m ready to have a healthy family again and enjoy the summer. I hope you have a super speedy recovery! Oh, yeah, and thanks for the recipe ~ yum! nvm sorry! just out of it here! z-pack is the best because it works so fast but it is very strong! We call this Taco Salad and it is the same thing!! Awesome!! We have it often in our house. Never heard it called haystacks!! Likin it!! Where I grew up, people called these haystacks, too. We have them for dinner after church every Sunday. See we call these walking taco’s and haystacks are a stack of little pretzels covered w/melted white chocolate! Both are yummy! It made me giggle when I saw they were having haystacks for dinner. I thought it was so odd to have pretzels with chocolate (we use butterscotch sometimes, too). I love the name walking tacos. I think I’ll steal that. We have a recipe very similar to this…the only thing different is we use crushed up doritos! Hopefully they gave you a Zpack…that usually kicks in at about day 3! My grandmothers recipe for “haystacks” is my grandfathers homemade secret recipe chili over fritos. They always serve it christmas eve. Yum! chili and fritos is delish for sure!!! So, what’s the best way to eat this? I’m thinking a fork would break up the chips a lot and well, fingers just isn’t very neat. If you broke up the chips into smaller bites you could potentially eat it with a fork. My family always forgoes a few of our manners when we eat these with our hands. :] It’s fun and kids love it because unlike most days, they don’t have to use a fork! We crush the chips when we put them on our plates and then layer the other stuff on top and eat it with a fork, like a taco salad. Something similar to this is: “Stackie Uppie” – great for after Thanksgiving leftovers. You start with a cooked rice base, then add chopped up cooked turkey and then you can have any other food items added to the “stack” – cheese, mushrooms, etc. You can then pour turkey gravy over the whole thing, Yummmmmmm! For a group, you can put out the different items in bowls and let the people create their own stack. this is the type of “build your own hay stacks” i grew up eating. in addition to what you mentioned we usually added olives, green onions, pineapple, broth (chicken, turkey or beef-depending on what meat we used) and then topped with chow mein noodles or slivered almonds. Thank you for sharing this recipe. Can’t wait to try it! Oh, those sinus infections are so awful. They really wear you down. I’ve tried a variation of this recipe but will add the meat next time! btw- I tried Crystal’s Crockpot Italian Chicken last week (can’t beat 2 ingredients!) and it was a HUGE hit. Kids kept asking what smelled so good that afternoon and then everyone dived in at dinner time and polished it all off. Delicious and beyond easy! Thank you! we call this a taco salad- haystacks are chinese chow mein noodles cookies dipped in chocolate! feel better! We called it Build a Mountain when I worked at summer camp. And of course we had a song(s) to go with it so I loved this meal. We have made these as a potluck meal after church. A real hit!! These are great for church dinners because it’s so easy to prepare and serve the ingredients. However, I did get a little tired of them when I was on a college choir tour, and every church that hosted a meal for our group served haystacks. We have them once per week now, and my kids love them. I make something nearly exactly like this, but we use tortilla chips and call them “Ultimate Nachos”. I would normally call this the Seven Layer Dip. Except that you layer each ingredient one after another in a fairly flat container. Looks cool if you use a clear dish =) Search for images of Seven Layer Dip to see what I mean. I grew up in the Pacific NW, and we always called these haystacks. We used to eat them at church potlucks all the time growing up. When we make this…. first layer is crushed saltine crackers, then cooked plain spaghetti noodles, then sloppy joe meat (without beans) and then whatever toppings we want. The options for toppings were lettuce, onion, kidney beans, tomatoes, shredded cheese and cheese sauce. We use chili, but the same concept! Soooo good, definitely one of my favorites! We have these for dinner after church every Sunday–and where I grew up people called them “haystacks,” too. 🙂 The great thing is that this is such a versatile meal. We use crushed tortilla chips and seasoned pinto beans (cooked ahead of time in the crockpot). We don’t eat a lot of meat, so the ground beef is optional for us. We also use fresh spinach and sliced green onions if we have them. I love guacamole, too, but I don’t often buy it or make it, unless I find a really good deal on avocados. So sorry to hear about the sinus infection. Haven’t had one in years – praise the Lord! Praying you recover quickly. You might not have been freezer cooking, but your inspiration to freezer cook was still lived out. I did one french toast casserole, two baked oatmeals (which we have already eaten – so good) and I made 10 batches of homemade blueberry syrup for the freezer. I needed to use up last years frozen blueberries before the new ones come on and I had some orange juice that was getting close to the expiration date. Blessings and thanks again for all you do. We call ’em haystacks here in our part of the country. We usually add cooked rice & warm cheese sauce to the stack too. We love haystacks! So delicious and so fun! oops, should say “layered” with chili. . .
My sister in law does this same basic recipe, but layers all the ingredients in an individual bag of fritos. It’s always a big hit! Boo on the sinus infection–I get one every year and have been lucky this year for it to have skipped over me (and thankfully, because i don’t think I could handle pregnancy ailments a sinus infection). Hope you feel better and gets lots of rest! Well wishes Crystal! Have you tried your FREE Netipot? We eat something called Hawaiian Haystacks that has a base of rice. Then you put on chicken gravy with chunks of chicken in it. Then you can add pineapple, coconut, cheese, lettuce, corn, tomatoes, or chow mein noodles (I think the chow mein noodles are where the name haystack comes from). You can add anything else you think of. It is a family favorite and easy to make! We had these at a friends’ house and it was yummy. 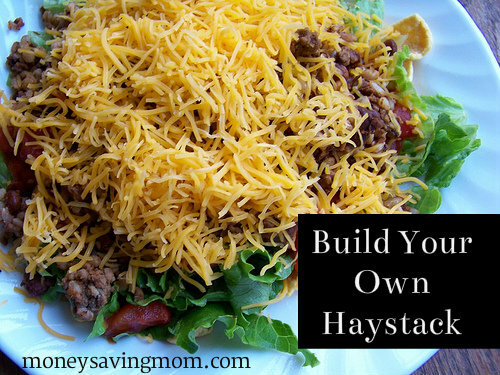 We have always called the haystacks, sometimes we use chili instead of taco meat. Most of the time we have these with the left over chili that I make so one or two nights you can have chili and then the 3rd night have haystacks and then if there is any chili left the 4th night we have hot dogs with chili and slaw. Have you tried a neti pot, Crystal? We always find that helps us kick a sinus infection a little more quickly. Takes a little getting used to, but definitely helps clear things up. I’ve not had the courage to try yet, but based upon the hundreds of recommendations on my Facebook Page yesterday, I think I’ll do it. I’m pretty willing to try anything at this point! I agree with Andrea. I use the NeilMed Sinus Rinse bottle. I make my own solution (those prepared packets are kinda pricey). To one cup of distilled water, I add 1/2 tsp sea salt (or regular salt) and 1/2 tsp of baking soda. Just warm the water in the microwave (about 15 seconds) and add to the rinse bottle (you’ll know when you get it at the right temperature). Also, if I can tell that I am about to get a sinus infection, my ENT told me to add about 3/4 tsp of hydrogen peroxide to the water solution. This really does the trick for me. All signs of infection goes away in a couple of days. We have hawaiian haystacks which involve rice topped with shredded chicken in a creamy sauce and then topped with a bunch of toppings. Toppings always seem to include pineapple and crunchy chow mein noodles, and then I’ve seen a lot of other toppings like coconut, green peppers, slivered almonds, peas, corn, celery, green onions, mandarin oranges, and cheese. That is what I’ve always thought of as build your own haystacks. Is it possible you can list your recipe? It sounds good. Thanks. boo! sinus infections are no fun at all. hope the meds work for you and you’re feeling better very soon! z-packs seem to work very well for my chronic sinusitis sufferer. How funny! In our house we call this “taco slop”. I think I like your name, Haystacks, better!!! We do a similar dish with a little different origin – Taco Rice. Post WWII on Okinawa, the locals discovered that the G.I.s loved taco meat, so they started with a base of sticky white rice, then taco meat, cheese, shredded lettuce and chopped tomatoes. My husband had it for the first time when he was stationed there sixteen years ago showed me how to make it *just right* when we were first married. We had the privilege of going back to Okinawa together and having the real local version together. Still make this one on a regular basis, but we’ll have to try your haystacks, too. I’m from Southern California and we call this “taco salad”. 😉 Made pretty much the same way, too! So sorry to hear you’re under the weather. Sinus infections are tough to kick with natural remedies but I have found that 5-10 drops of Grapefruit Seed Extract (the liquid drop form) mixed with warm water (about 1/4 cup) and flushed through the sinuses (a neti-pot works best for this) twice a day for 5 days kicks it. You actually start feeling better within 24 hours…antibiotics don’t even touch my sinus infections so this is the only way for me to truly get rid of them. Make sure you’re taking a FULL-SPECTRUM probiotic while you’re on antibiotics and for at least a week after you’re done with the antibiotics otherwise you’re compromising your healthy immune functions. thanks for your post. it was so interesting to read the many variations your readers have for “haystacks” …… and our family has one more! =) we layer rice, taco meat, shredded cheese, diced tomatoes, shredded lettuce, crushed nacho chips and then top off the haystack with a velveeta cheese sauce. we just had it for dinner tonight. one of my husband’s favorite meals. We call this taco salad too. It’s one of our favorites! Sinus infections are miserable. I get one everytime I’m pregnant. I hope you feel better very soon! I make haystacks as a dessert: melt a bag of butterscotch chips with 2 Tbl of peanut beutter, stir in a few cups of potato sticks (shoestring style poatoes) and 1 cup of peanuts til coated. Place in small piles on waxed paper til set. YUMMY sweet and salty together! Girl, it’s 11:53 at night and now I am totally hungry. I am definitely making this tomorrow. Thank you so much for sharing!!! Hey I wanted to let you know I’ve been a chronic and acute sinus infection sufferer for decades, was even recommended for sinus surgery once. After antibiotics for years which destroyed my health, I also tried E-V-E-R-Y-T-H-I-N-G and none of it worked. I heard FlyLady one day many years ago on her radio show, and her sidekick Leanne Ely (Dinner Diva, ) described her chronic sinus issues and said she’d found something that worked. I had negative faith it would work, in fact I ordered it from VitaCost.com just because of their easy, no questions asked returns policy. Well it wasn’t psychosomatic nor placebo effect because I was very jaded and was sure it absolutely would NOT work; but SinuFix capsules (not spray) worked for me, I haven’t taken one antibiotic since. A couple times the sinus infections did come back, when I stopped taking SinuFix; but I’m an extreme case. I take a maintenance dose now of 1 a day with my vitamins, and I stay cured and sinus-infection-free. I order it 3 bottles at a time to ensure I NEVER run out. It is cheaper than office visit copay, and cheaper than prescription copay, it is all natural and doesn’t wipe out your immune system in the gut, as antibiotics do. The two least expensive sources online are which is up north, and which is East Coast. If you are West Coast, iHerb.com which is on the West Coast also carries it but Swanson has a better price. Also Swanson and Vitacost you can pay by PayPal when you check out so you don’t have to give your card # over the net, and both have super cheap shipping with no strings, no minimum, no maximum, just flat $5 ship (and frequent free ship specials). Also Swanson and VitaCost ship to PO Boxes no problem; iHerb has shipping restrictions and shipping strings attached and PO Box is a problem and I don’t remember if they accept PayPal; since I’m on the East Coast I only use Swanson & VitaCost. If you were my neighbor I’d definitely bring you a sample to try, within 24 hours of taking it you physically feel a difference, I’m telling you this stuff works like a charm. I’ve handed it out to many people and every single one said it worked for them, too. I don’t work for nor do I know anyone involved with SinuFix, Swanson, nor VitaCost, and don’t have any personal gain or interest in promoting SinuFix other than to help people. As a former sinus sufferer, I went thru Hades and I KNOW HOW AWFUL IT IS. Every Fall, and every Spring; sometimes I’d stay sick and on prescription the whole 6 months. I even had one doc accuse me of selling the antibiotics because I was on them so long; really rude. The same one who wanted to do surgery on me and tried to guilt me into it and manipulate and pressure me into surgery – NO THANK YOU. So SinuFix capsules really, really work. I don’t like neti pots or sprays so I’ve never tried the SinuFix spray, and can’t recommend it. Thank you so very much for your recommendation! We do this and call them taco pile-ups! This sounds weird, but, pecans and shredded coconut add sweetness and crunch to it! A friend suggetsed it and we do it now. Its yummy! Haystacks….kind of, sort of like nachos. I like it! Emergen-c or other cold and infection prevention remedies when you already have the infection-it makes you even more miserable because your symptoms become increased as your body reacts more [efficiently]. (I never knew this for so long and learned it recently! What a great piece of advice that was!) By now now I hope you are feeling better! I’ve had a few bad sinus infection in the last few years and I cannot survive them without my Neti-pot. That thing is a miracle worker. I use if before bed and then and immediately upon waking. Its also great when my allergies go haywire. Its cheap medicine, and it works. Hope you’re back to 100% soon! Hi Crystal, hope you’re feeling better. If you’re not, make sure your docs check for other causes. I was misdiagnosed with a sinus infection for months before getting a proper diagnosis which was much more serious. If you are not getting better ask for a chest x-ray and blood work. Especially if you are having night sweats and fatigue. Hope you’re feeling better! I have had something similar with the Fritos at a local carnival. They just used a small package of Fritos & added the meat. There was a toppings bar with things like salsa, olives, cheese…it was sooo good! I’ve seen those at carnivals, too, and they were called walking tacos. Этот нужный сайт с информацией про https://steroid.in.ua.